These compact and user-friendly shrink tunnels are used to pack products using PVC/POF/LDPE shrink films. The basic features of the tunnels are variable speed drive to control the speed of the conveyor, high velocity air cutter blowers for Uniform Airflow System, faster heating system, and variable temperature control. Some of the other optional features, which are available, are silicon sleeves for the conveyor rods, fully stainless steel construction, variable speed drive for the blower, in feed and out-feed extension conveyors, Mesh type conveyor, Roller type, Tefllon belt conveyor, etc., A speed of 2-4 packs / Minute. 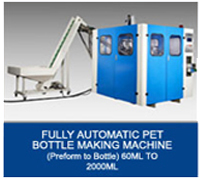 These model machines are custom made system for packaging of Products with Shrink Films with all sides sealing. 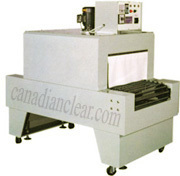 The machine is automatic in process, with automatic conveying of the product, sealing, and heat shrinkage. The product to be packed will be sealed in first wrapping unit, and then advance to second stage where the sides of the pack will be sealed. These units are designed upon the size and quality item and the requirement of the customer. 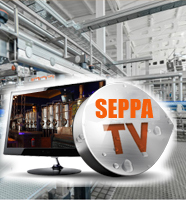 The system is suitable either for Independent use or can be utilized in automated production line. A speed of 4-8 packs / Minute. 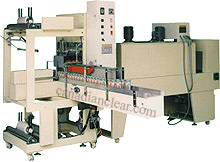 These model machines are custom made system for packaging of products with Thick Shrink Films with all sides sealing. The machine is an automatic machine in process, with automatic coveying of the product, sealing, and heat shrinkage. Automatic Cup Filling Machine is designed to fill and seal plastic cups automatically with speeds of 20 cups/min to 100 cups/min. 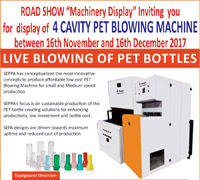 Various model of machine are there to achieve the above speeds. The machine comes with either a linear conveyor or rotary plate. The cups are loaded to the cup holders from the cups stack automatically. The cup holder carries to the filling stations where the cups are filled accurately. The filled cups are then provided with seals by a Pick & Place System. After which the sealing of cups are done by the cup sealer. The system is in-built with PLC control and Safety Protection Devices. These machines are rugged ones, which can run continuous for long hours without gap for chamber cooling. 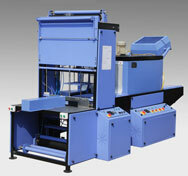 These machines are used to wrap heavy products with LOPE/LLOPE shrink film with higher thickness. Live roller rod conveyors are provided in the machines, variable speed drive system for adjusting conveyor speed, fully re-circulating heating air system enable lesser power consumption, highly efficient heat-up with heaters provided on three sides of the chamber, temperature controlled automatically, variable temperature controller, cooling chamber. A speed of 6-20 packs / Minute.